Maggie started knitting at age six in Country Antrim, Northern Ireland and pretty much hasn't put down the needles since. Maggie Jackson is the founder and creative spirit behind the innovative knitwear company, Maggiknits. Maggie is a successful designer with a special knack for teaching other knitters how to improve their skills and find greater joy in their work. Maggie comes from the world of fashion design and takes great care in how the garments will look. Her focus is on creating clothing that compliments each person no matter there shape or size. Maggie brings a fashion designer's approach to knitting and how simple stitches can be used to create fabulous one-of-a-kind works garments. Maggie intelligently designs entertainment into her patterns by intentionally making things that are entertaining to knit. Maggie will build stitch patterns and design features into her work to make the process of creating it entertaining so knitters don’t get bored while knitting her patterns. On top of being a creative genius, Maggie Jackson has a great Irish sense of wit and is fun to be around. Knitters thoroughly enjoy their time with Maggie because she connects with people in a meaningful way. Come expecting to laugh until the tears flow, enjoy some wine and the joy the travel experience brings while visiting such wonderful places. Join Maggie Jackson on this knitting trip and she’ll keep you in stitches with her Irish humor and wit. Win a prize if you can tell Maggie an Irish joke that makes her laugh! Maggie was brought up on a small dairy farm in Northern Ireland where, at six years old, she was taught to knit and began her journey from quiet farmer's daughter to award-winning international knitwear designer! She was trained as a fashion designer and did ready-to-wear for 25 years, selling to Nordstrom and Neiman Marcus in the US as well as having her own retail shop in Ireland. Maggie was the first fashion designer to set up in, a then troubled, Northern Ireland in 1977, and she is now the president and lead designer for her company Maggiknits, a very successful knitwear design company. 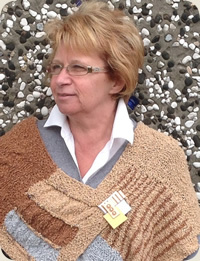 Today, Maggie supports the Maggiknits Collection by showing her work at major knitting shows, by teaching knitting workshops, giving book-signings to meet her fans, as well as at both international and national retreats, with the aim of sharing her knowledge and encouraging knitters to think outside the box! Maggie is known for telling an Irish yarn here and there with her own Irish sense of humor! Maggie’s style is very recognizable with many customers across the USA, Canada and the UK. Although Maggie’s success keeps her busy she still finds time to share her expertise with others. Maggie Jackson was, at one time, President of the Northern Ireland Fashion Designers Association, a university lecturer to motivate fashion students and pass on her experiences and knowledge as well as consulting in forecasting, color coordinating, and designing freelance. Five times Maggie was chosen to design and make the evening dress for Miss Northern Ireland for the Miss World Competition, winning 2nd place for her design in the second year. At the same time she was short-listed for Hong Kong Fashion week, judged by Vogue, Mary Quant and Jeff Banks. Due to the demand from the knitting industry overshadowing her ready to wear collection sales, especially in the USA, she closed her Belfast and New York offices in order to dedicate her time to that. Maggie has developed her own Maggiknits yarn line consisting of 18 yarns produced in Ireland, Italy, Spain and the UK. Maggie Jackson has 18 knitting design books published under Maggiknits. Some of Maggie’s books are now out of print and selling at high prices if found as they have become collectors items. Best known is Maggie’s Ireland by XRX. A member TNNA in the USA and was previously a member of several professional associations when she lived in Ireland. In addition to her professional affiliations, Maggie has a string of awards she has earned over the years. Maggie’s entrepreneurial skills won her the coveted title of Northern Ireland "Young Business and Professional Woman of the Year" in 1989 and runner up in the UK. Followed by the "Guinness Special Award for Design Excellence", 2nd place in the International Mohair Association Competition , and her achievements have won her a place in the "Who's Who in Textiles" in the UK. She also won a Knitmaster competition judged by Vogue, Bill Gibb, Lord Lichfield (the Queen’s cousin, a famous photographer) and others in the UK beating applications from St. Martin’s and the Royal College in London. Maggie studied fashion at the College of Art and Design, Belfast receiving a BA Honors. In her post-graduate year specializing in Fashion Knitwear she was awarded the highest marks in the history of the college (now University of Ulster).